This article is about Mewtwo's appearance in Super Smash Bros. Melee. For the character in other contexts, see Mewtwo. Mewtwo (ミュウツー, Mewtwo) is an unlockable character in Super Smash Bros. Melee. It is one of eleven playable characters that can be unlocked in the game. Mewtwo currently ranks 21st on the Melee tier list, in the F tier and its worst placement in the whole series. While initially deemed the worst character in the game, the changing metagame of Melee caused Mewtwo to experience a rise of five places. Mewtwo's positives include a long, safe, and difficult-to-counter recovery, a rather good chaingrabbing ability, a large variance of mixup options, a decent combo ability, and among the best throws in the game. However, Mewtwo suffers from an unusual combination of being a large target and a lightweight; this, combined with its floatiness, makes it an easy target to KO. Additionally, Mewtwo has limited KOing options, with most of them having little reach, and many weak attacks, giving it relatively fewer approach and offensive options as other characters. To unlock Mewtwo, the player has to play 20 hours of VS. matches. The time is reduced by the number of human players in said matches; 1 player requires 20 total hours, 2 players require 10 total hours, 3 players require 6 hours and 40 minutes, and 4 players require 5 total hours. The time can be further reduced to 4 hours by playing Lightning Melee, which speeds up the in-game timer to 125% of normal speed. Alternatively, the player can play 700 VS. matches to completion to get a chance to fight Mewtwo. When fought, Mewtwo appears on Final Destination, with the music from Poké Floats playing. Mewtwo defies any typical character archetype; despite being a big target with some powerful moves and a very high air speed, Mewtwo has a rather slow dash, a low weight and a low falling speed. As a result of these traits, Mewtwo has among the longest wavedashes in the game, but a very poor SHFFL, despite its low lag, high speed aerials. Mewtwo also can effectively moonwalk, potentially aiding its edgeguard game. Among Mewtwo's primary strengths is its varied grab game. Despite an only average grab range, Mewtwo's throws can serve a variety of purposes; its forward throw is good for racking up damage or starting combos and its down throw can potentially start chainthrows or be used as potential combo starters when compounded with one of its tilts. Mewtwo's back and up throws are also among the most powerful in the game, and both can KO reliably on some characters at 100%; the differences in their trajectories also gives Mewtwo varied options against both fast fallers and floaty characters (the up throw works better against the latter, while the back works better against the former). Mewtwo also has very good approach and combo options. Despite a poor SHFFL (among the worst in the game), Mewtwo's high air speed, low falling speed, and fast, low lag, high hitstun aerials also gives it plenty of options in the air, easily and effectively comboing against many characters. Mewtwo can also perform a Double-Jump Cancel, which, when combined with L-Cancelling, is an exceptional substitute for SHFFLing, as Mewtwo can quickly perform a Forward Aerial and follow up with another option. Mewtwo also has a very long wavedash (the third longest in the game), making techniques such as wave-smashing and wave-grabbing considerably more useful for Mewtwo. Mewtwo also has rather good range. Its forward smash can extend relatively far, and all of its tilts have long, disjointed hitboxes, allowing Mewtwo to effectively attack from a distance, especially when compounded with its long wavedash. Mewtwo also has one of Melee's strongest projectiles in Shadow Ball. When fully charged, it can KO reliably at roughly 100%; its jagged path also can make it difficult to dodge, and its recoil can potentially extend Mewtwo's recovery. Mewtwo also has possibly the best recovery in the game. While it cannot harm edgehoggers, a combination of a low falling speed, a high air speed, among the best jumping prowess, and long distance with its Teleport give Mewtwo a very long and safe recovery. Additionally, its neutral aerial slightly slows down its movement in the air, and slightly charged Shadow Balls can give recoil sufficient enough to send Mewtwo backwards a good distance. Lastly, its Confusion attack can act as a second jump (when used in the opposite direction of its momentum) and Disable can be used to stall its descent. Mewtwo's biggest flaw is that its varied attributes hinder it in terms of survivability. A combination of a large frame and floatiness makes Mewtwo easy to juggle and KO; while other large characters such as Donkey Kong have added weight to make them resilient to some KOs, Mewtwo has no such advantage. Mewtwo's defense game is also mixed; its air dodge makes it invisible and opponents cannot guess where it will appear and its rolling dodges are fast and cover much distance, but Mewtwo's large frame makes it prone to shield stabbing, and its spot dodge also being rather poor. Mewtwo also has possibly the worst tech ability in the game; although its rolling tech covers a long range, it is very slow compared to that of other characters, and as a consequence, Mewtwo is particularly easy to tech-chase. Mewtwo also suffers from bad KO options; all of its strongest moves have either poor range or low speed. Its back and up throws are powerful, but they require Mewtwo to grab the opponent first, and the latter throw's KOing capabilities are extremely dependent on the opponent's falling speed (for example, Fox and Falco would survive the longest despite having the third highest vertical endurance). While having a wide variety of other KO potential attacks, most of its attacks suffer from range and/or speed problems, such as its forward air, down smash, down air, and Shadow Ball. Mewtwo also has highly situational specials. While Confusion can temporarily distract opponents, it has high ending lag and relatively little use; additionally, while it can reflect projectiles, they still remain property of the original character's (meaning they won't hurt whoever it came from). Disable only works in close ranges, and cannot combo effectively into other attacks. For a gallery of Mewtwo's hitboxes, see here. 6% Mewtwo emits a pulse of dark energy out of its hand, which can be followed up by repeated blasts of shadow energy. The first hit can both be canceled, and can lock opponents. 10% (near), 8% (mid), 5% (far) Mewtwo flicks its tail forward. It has rather low startup and good disjointed range, making it a good spacing tool. Can be aimed up or down. 10% (near), 8% (mid), 6% (far), 5% (tip) Mewtwo backflips and swings its tail. It deals more damage to opponents near Mewtwo. It is a good combo starter, great for juggling. 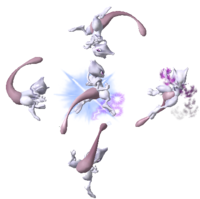 9% (near), 8% (mid), 5% (far) Mewtwo spins once, sweeping its tail in a low profile. Has a disjointed hitbox. It is a reliable combo starter that can lead into many of its moves. 9% (clean), 6% (late) Holds its arms out while sliding, inflicting damage with shadow energy. Rather long ending lag. 20% (blast), 12% (arms) Thrusts both arms forward, releasing a pulse of shadow energy. Similar to Mario's forward smash, with the sweetspot being the blast itself. Fairly good range and damage, but rather low knockback. The sweetspot has transcendent priority. 1% (hits 1-6), 10% (hit 7) Holds its palm up, summoning a large, dark vortex above itself that hits multiple times. Can easily be SDI'd out of, and deals rather low knockback. The last hit of the attack can KO around 120%, but can be difficult to land. 15% Extends its arm downwards and summons an explosion of shadow energy at its feet. Good knockback and speed, with moderate range and a good edgeguard and or combo finisher; however, it has the unusual property of only hitting in front of Mewtwo. This attack has transcendent priority. In terms of starting lag, it is the slowest down smash in the game (hits on frame 20), though its ending lag is very low. 1-2% (hits 1-8), 4% (hit 9 & landing) Releases a long lasting shock out of its body. Good punishing option and great OoS option. Good damage if the entire attack hits, as well as good combo extender. Also slows down Mewtwo's falling speed slightly, making it useful for recovery. 14% Swipes its left arm forward, engulfed with shadow energy. High vertical knockback, useful for combos, juggling, and KOs, but mediocre range. Can lead into an up tilt if DJC'd, depending on the character. Can KO at 120%. 13% (near), 11% (mid), 9% (far) Whips its tail behind itself. Decent range and is a decent wall of pain technique. Deals more damage if the opponent is closer to Mewtwo's body. 10% (near), 12% (mid), 14% (far) Flips upward, hitting with its tail. A good juggling move. Deals more damage if the opponent hits the tip of Mewtwo's tail. 14-16% Flips backward and stomps downwards. Acts as a meteor smash, albeit a very weak one (unless sweetspotted at the foot), due to its low ending lag and Mewtwo's stellar recovery, making it a low-risk to use offstage. The sweetspot is Mewtwo's foot, with the sourspot being its underbelly. 3% Mewtwo zaps the opponent in its grasp. Moderately slow. 3% (throw), 2% (Shadow Balls) Mewtwo throws its foe diagonally forward and then shoots five small Shadow Balls (which can be absorbed and reflected). Great damage racker if used against a wall or overhang but can be SDI'd out of. The speed which the Shadow Balls are fired is dependent on the opponent's weight. 12% Mewtwo uses Psychic to swirl the opponent around its body before launching them upwards. The strongest up throw in the game and the strongest throw in Melee overall (being even stronger than Ness's back throw), being one of Mewtwo's best KO moves, which begins KO'ing at around 120%. At low percentages, it can chaingrab fast fallers and can lead into forward aerial to regrab on Fox/Falco. 5% (hit 1), 6% (throw) Mewtwo throws the enemy down and strikes them with its tail. Can reliably lead into follow-ups, usually forward aerial. Can be used to chaingrab large characters like Bowser. The tail can hit nearby opponents. 7% (tail), 5% (sides) Mewtwo telekinetically gets itself up and spins around with its tail extended. Anyone who comes in contact with Mewtwo's body will be shocked. 6% (tail), 5% (sides) Mewtwo telekinetically gets itself up and spins around with its tail extended. Anyone who comes in contact with Mewtwo's body will be shocked. 6% (body), 8% (tail) Mewtwo flips onto the stage, using its tail to attack. 10% Mewtwo telekinetically walks on the side of the stage, then jumps on the stage and swipes its hand forward. Shadow Ball 3-25%, 2% (charge hits) Mewtwo concentrates shadow energy into a large sphere, which can be canceled partway by pressing either the L or the R button. The attack itself is a powerful projectile that travels in a wavy path, exploding when it comes to contact with a surface (though the explosion doesn't do anything). If used in the air, Mewtwo will recoil backwards a great amount, which can help or hinder its recovery. Confusion 10% A command grab that spins foes around, flipping them. This is very punishable, as hitstun is only as long as the character is spinning. The attack also reflects projectiles, but this has a fatal flaw: the projectile's ownership does not change. This means that only projectiles that would normally hurt the user would feel any effects of this. Teleport - Mewtwo quickly vanishes and reappears in a different location. Can be directed with the control stick. Mewtwo is completely invulnerable during the move. Disable 1% Mewtwo shoots out a short beam from its eyes forward, stunning any opponents who make eye contact with Mewtwo. If the move is performed whilst the character is already dazed, he or she will be launched. If the move hits an opponent in the air, they will take no knockback, but will be put in their tumbling state. This attack can be reflected and has transcendent priority. For its dash attack while holding a battering item, Mewtwo spins the item in front of itself for a total of 20 possible hits, overall dealing more damage but much less knockback than other characters' dash attacks. Unlike most characters' dash attacks, Mewtwo's dash attack while holding a Lip's Stick does not produce any of the "magic dust" that Flowers the opponent. Crosses its arms and spins in midair, laughing sinisterly. Slowly rises its hand towards the face, clenching its fist. Crosses both its arms, then moves them outward. An excerpt from the main theme of Pokémon. Thrusts its hand forward, radiating dark energy, and groans. Crosses its arms then turns its back to the screen, looking over its shoulder laughing. "私はなぜ ここにいるのか...？", which translates to "Why am I here...?" or "愚かな！", which translates to "Foolish!" Spins around and ascends, laughing. ; "私はまけるわけにはいかない！", which translates to "I cannot lose!" Mewtwo has a poor matchup spread. It counters only Kirby, soft counters six characters, and has one even matchup against Yoshi. On the downside, it is soft countered by eight characters, countered by four, and hard countered by four. Leffen - Although more known for his dominance with Fox, he is also considered to be one of the best Mewtwo players in the world. Most notably took a set off Professor Pro. Taj - Considered to be the best Mewtwo player in the world, Placed 17th at Apex 2010. Mewtwo has traditionally placed very low in tier lists, with a very small playerbase dedicated to using it. It was initially seen as the worst character in the game, according to the first tier list (dated October 2002), and hovered around the bottom 4 spots for many years, once even falling back into last place position (eighth tier list; July 2006). Mewtwo eventually moved out of the bottom tier due to increasing tournament placings by Taj, who is widely considered to be one of the best Mewtwo players in the world, though it never surfaced into the higher tiers. Although Taj has been far less active, players such as Zoma, Leffen and occasionally Mew2King have represented Mewtwo in larger competitive tournaments. The last released tier list has Mewtwo placed in the F tier, cashing in at 21st place. Mewtwo can appear in Classic Mode as an ordinary opponent, as an ally or in a team with Ness or Bowser in team battles or as a metal character in the penultimate stage. In Mewtwo's appearances, it either appears on Pokémon Stadium or Final Destination, with the Poké Floats theme playing; when fighting alongside Ness, however, it appears in Fourside, and when fighting alongside Bowser, it appears on Battlefield. Adventure Mode makes no concessions to Mewtwo when it is unlocked, making it the only Pokémon character that does not appear alongside the many Pikachus in Stage 7. In All Star Mode, Mewtwo and its allies are fought on Battlefield, as all other Pokémon stages are already used by Pikachu and Jigglypuff. On the stage, the music from Poké Floats plays. Event 40: All-Star Match 4: Mewtwo is the fourth opponent fought in this series of staged battles. The selected character battles it on the Final Destination stage with a stock of 2 while Mewtwo has 1. With a timer of four minutes, the player must defeat it and the other four characters one-by-one with the overall time and damage: Marth, Luigi, Jigglypuff, and Mr. Game & Watch. Event 51: The Showdown: In the game's final event match, the player must fight against a team consisting of Mewtwo, Ganondorf and Giga Bowser. All characters have three lives, with no time limit. Mewtwo picks up and uses items via its telekinetic power, never actually touching them outside grasping the Parasol while falling. One of its idle poses involves it spinning its held item around. This results in Mewtwo having poor usage of the Hammer; unlike all other characters, it spins the Hammer sideways around itself, and so is vulnerable from above while using it. Oddly, when air dodging with an item, the item is visible while Mewtwo is not, spinning in a tight, flickering circle once every 4 frames. When hit, shooting a charged Super Scope blast, or using Disable, Mewtwo's irises turn yellow, similar to how Mr. Game & Watch's body turns yellow when shooting charged Super Scope shots. Mewtwo being of light weight (85 units) contradicts its Pokédex information, where it is supposed to outweigh any non-overweight human. In fact, it is outweighed by every human character in Melee (excluding Roy, Young Link, and Marth in PAL regions). Mewtwo's fully charged Shadow Ball is seen hitting Donkey Kong in the introduction to Melee, making it one of the five hidden characters, along with Ganondorf, Jigglypuff, Young Link, and Pichu, to have some kind of involvement in the intro. Mewtwo, like Marth and Roy, when faced in Classic or All-Star mode, is fought on a stage that does not match its universe (either Battlefield or Final Destination). However, the music that plays when fighting it is from Poké Floats. Mewtwo is also the only character in Melee whose down smash only hits on one side; this concept has been used by several characters in later games. Mewtwo is the only Legendary Pokémon that existed at the time of the release of Melee that wasn't a Poké Ball Pokémon in that game. 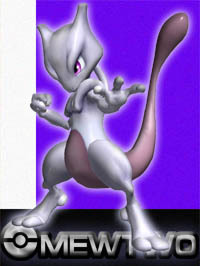 Mewtwo's design in this game looks quite different than in later games from SSB4 onwards: it has a more grotesque design, with a larger head and bulging eyes, its body is smaller and thinner, with a slightly hunchbacked appearance, and its tail is shorter, while later appearances portrayed it as being more humanoid in appearance, with a slightly smaller head and eyes, a taller, muscular, and more upright body, and its tail is longer. Mewtwo is the first playable Pokemon character whose alternate costumes merely change its color altogether, rather than giving it an accessory for it to wear. This page was last edited on February 18, 2019, at 07:36.